Typically, the number of jobs in the global solar heating and cooling industry is based on general assumptions and fragmentary extrapolations. The authors who publish the two annual studies on these job numbers have tried each year to improve upon the database – with success, although they still end up with different figures. The Solar Heat Worldwide Edition 2016 published by Austrian institute AEE INTEC estimated that 730,000 people had a job related to the manufacturing, installation or maintenance of solar thermal systems in 2014. The study Renewable Energy and Jobs - Annual Review 2016 by the International Renewable Energy Agency (IRENA) put the figure at 939,000 in the global solar heating and cooling industry in 2015 – 12 % of the world’s 8.1 million jobs in the renewable sector (find both studies attached). This year, AEE INTEC has employed a new methodology for its Solar Heat Worldwide publication. “We have used different factors based on the country’s framework conditions to arrive at the newly installed collector area per full-time job,” explained Werner Weiss, one of the authors of Solar Heat Worldwide (see the following table). The four factors were used on the 2014 collector area additions from 61 countries gathered as part of the Solar Heat Worldwide study, which resulted in a total of 730,000 full-time jobs around the globe. China´s job market is the most difficult to assess. According to the factor of 87 m²/job, China´s SHC market engaged 500,000 people in manufacturing, sales and maintenance last year. However, statistical information from China can lead to fairly different conclusions, as IRENA’s Michael Renner, who is one of the authors of the annual job study, confirmed: “The Chinese National Renewable Energy Centre (CNREC) gave us the figure of 560,000 jobs in manufacturing and an additional 1.83 million jobs in construction and installation in 2015. After discussing the numbers with our CNREC contact, we ended up with an estimate which considers 10 % of the second figure to be equivalent to a full-time job.” This puts China’s job figure at 743,000 within last year’s global IRENA statistics. Renner has also stated that he would consider using the improved methodology from this year´s Solar Heat Worldwide study for the Annual Job Review 2017. 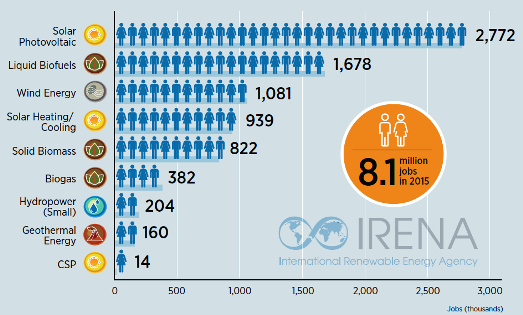 Number of jobs in selected countries; the total adds up to 939,000 people employed in the solar heating and cooling industry, according to the IRENA study Renewable Energy and Jobs - Annual Review 2016. This news was written by Vanessa Kriele, a German freelance journalist specialised in renewable energies and world economics.